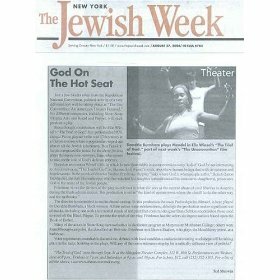 My response to a piece on Benjamin Cardozo in last week’s Jewish Week made it into this week’s issue. Check it out: My Letter to the Editor. There is no such thing as a Dominican Jew, unless both of your parents were or you had a relative on your family. I think that you have a big identity problem sister. i respect the Jewish religion, but i think that you are a disgrace for them, they are very polite and quiet and from what i see this looks like an add agency. PS: Im dominican, and you should be ashamed of yourself. Hi, I'm Dominican, I'm Jewish. Welcome to my blog. If you don't like it, don't read it. Or perhaps you should, maybe you would learn something. Right, like you're going to take life advice from someone called “Anonymous.” Sounds like a troll to me. Oh, for corn's sake of COURSE there are Dominican Jews, just like there are Irish, Colombian, Iranian, Ethiopian Jews and so on…probably is a Cambodian Jew if we look hard. Judaism is a religion, NOT a race, you twit! And not all are quiet and polite…you should see the meshuggas around Purim! (or me anytime) Yowser! Jews come in all varieties as do uninformed people who are afraid to identify themselves. Colombian. Irish. New Yorker. Jewish. You wanna tell me I'm NOT any of them? Aliza, there guesses…Anonymous is a he and a black hat Haridi, si?